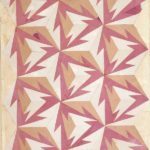 The Wolfsonian’s latest exhibition brings the history of Italian textile design from Genoa to Miami. Design drawing for a rug, 1947, for MITA’s Rug Competition for the T8. VIII Triennale, Milan Antonia Campi, designer, tempera and graphite on paperboard. 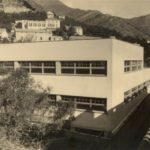 MITA Factory, Genoa Nervi, 1940, Luigi Carlo Daneri, architect, Foto Metvan, Genoa, photographer. “Made in Italy.” Which other three little words, almost always placed in a hidden, unassuming location on a variety of artistic and agronomic products, have come to hold such strong cachet worldwide? In fact, none of the artworks on view in the eponymous exhibition at The Wolfsonian–Florida International University in Miami Beach includes that evocative phrase (and the “Made in Italy” mark was not put into place until 1980). But none of the masterpieces here would even require such a moniker. Their Italianness, both in their quality and in their artistic composition, needs no regulated stamp to be understood. “Made in Italy: MITA Textile Design 1926–1976,” organized with The Wolfsonian’s sister institution, The Wolfsoniana–Palazzo Ducale Fondazione per la Cultura in Genoa, celebrates the artistic output of the Manifattura Italiana Tappeti Artistici (Italian Artistic Carpet Manufactory), an enterprise that, for 50 years, espoused the finest Italian craftsmanship and newest textile technologies in all their modernist furnishing and sartorial glory. Curators Silvia Barisione, Matteo Fochessati, and Gianni Franzone present MITA’s contributions in the history of textile and carpet production, situating the company at the forefront of the Italian avant-garde, from Futurism to Abstract Expressionism and even a bit of Pop. Established in 1926 by the industrialist and entrepreneur Mario Alberto Ponis in Nervi, a suburb of Genoa, MITA was in many ways ahead of its time. Ponis envisioned a business that functioned as a hands-on factory as well as a place for artistic experimentation and learning. His friendships with many members of Italy’s cultured circles led to the company’s first collaborations with artists, drawing on Italian artisanal traditions while embracing the spirit of mechanized production. This marriage of art and industry would irrevocably change the Italian design landscape until the firm’s closure in 1976. Ponis collaborated early on with an impressive roster of painters, designers, and architects, including the Rationalist architect Mario Labò, the architect-designer of the Novecento movement and Domus editor Gio Ponti, and the Futurist artist Fortunato Depero, whose textiles and carpets had already earned him accolades at the 1925 Exposition in Paris. Depero’s 1927 drawing for a carpet produced by MITA would have made a particular impact with its fiery colors and explosive forms. Depero pared down the geometry to a deceivingly simple two shapes and four colors, but the dynamism matches and arguably even exceeds that of its cousins being produced in France at the same time, like Sonia Delaunay’s textiles, which Depero no doubt saw when in Paris. Testifying to MITA’s initial artistic success, Depero’s Futurist colleagues Filippo Tommaso Marinetti and Giacomo Balla even purchased rugs from Ponis. Shown alongside three colorways of this rug design are period ceramics, illustrating the modernist Gesamtkunstwerk in interior decorating during the 1920s, and Depero’s famous bolted book, which, in wonderfully Futurist fashion, was finished with hardware so as to damage the books shelved next to it, and which included a dedication to Ponis. In the 1930s, Ponis worked with Rationalist architect Luigi Carlo Daneri to design the new and ultra-modern MITA factory, itself an ode to French modernist architecture with its flat roof and ribbon windows in the style of Le Corbusier. Inaugurated in 1941, the factory was quickly closed and refitted to produce helmets, life jackets, and emergency food bags. In the postwar period, at a moment when Italy sought to find an artistic and industrial identity that could help reinvigorate the economy, MITA reopened and its production expanded to include tapestries, limited-edition and one-off artist panels, yard goods, and even scarves, to compete with the new wave of high-end Italian textile manufacturers like Fede Cheti and the Manifattura JSA, who shared some designers with MITA, including Ettore Sottsass, Jr. Sottsass’ abstracted kaleidoscope of hues, along with sculptor and ceramicist Antonia Campi’s rhythmic inversions of polymorphic shapes and lines, comprised MITA’s winning entries for the rug competition at the VIII Triennale of Milan in 1947. During the 1950s and 1960s, MITA added to its ranks artists like Eugenio Carmi, Enrico Paulucci, Gio Pomodoro, and Leo Lionni (best known for his children’s book illustrations), to name just a few. 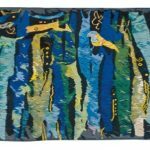 Unlike other Italian fabric manufacturers who commissioned artists, though, Ponis smartly branded MITA’s goods as standalone works of art, even signed with the artists’ names, whether in printed ink or color, or woven into the tapestries. These one-of-a-kind works helped MITA to establish itself internationally, in regular showings at the Triennali after 1947, as well as by participating in the landmark 1950 touring exhibition in America, “Italy at Work: Her Renaissance in Design Today.” In 1951 at the IX Triennale, Italian artist textiles were exhibited for the first time. 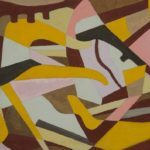 Among the invited companies was MITA, whose works included those by painters Carmi and Paulucci. On display at The Wolfsonian is Carmi’s Mulinello (Whirl, 1957), exhibited in 1959 at the Fundación Mendoza in Caracas. 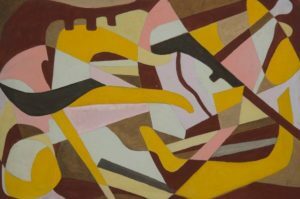 A rumination on Italian abstract expressionism in neutral tones, Mulinello could rival the works of the Americans at that moment, both in its composition and scale. At the X Triennale in 1954, MITA focused its attention on one artist—and one work, as the title of the exhibition made clear. The Mostra del Pezzo Unico (Exhibition of the Unique Piece), featured Favola (Fable), a monumental tapestry by Emmanuele Luzzati, best known today for his theater designs and book illustrations. Favola depicts a myriad of characters from the uplifting fairy-tale worlds Luzzati created through his illustration and stories, drawing as much from postwar optimism and a need to escape Italy’s recent war-torn past as from its more distant theatrical past in the form of the Commedia dell’Arte. Perhaps most telling of the company’s mid-century success are MITA’s commissions “at sea” to decorate the luxury ocean liners Andrea Doria (which sank in 1956), Eugenio C., and Leonardo Da Vinci. MITA’s work for the three vessels aptly recalls Gio Ponti’s summation of these cruise ships as “floating art galleries.” Among the stars of the Wolfsonian show is another of Luzzati’s tapestries, Flauto Magico (Magic Flute, 1966); Russian-German artist Michael Rachlis’ tapestry design; and Paulucci’s Gabbiani (Seagulls, 1960). Luzzati chose cool, aqueous tones and forms that suggest not Mozart (although the operatic reference was no coincidence for the seasoned stage designer) but rather the seaweed and coral glimpsed in underwater exploration, an appropriate reference given the tapestry’s original home in the Eugenio C.’s first-class dining room. The circa-1952 tempera sketch by Rachlis for the tapestry in the Andrea Doria first-class reading room is all that survives, but one gets a sense of the artistry in wool paired with a maritime decorative program. MITA produced Paulucci’s design for a silk scarf, fittingly featuring seagulls, as a giveaway for the inaugural voyage of the Leonardo da Vinci, which was built to replace the Andrea Doria. (In the 1960s, silk scarves were a fashionable means of promotion that was particularly favored by corporations, from pasta producer Prince to furniture giant Knoll.) Luzzati also produced a scarf, Cabo San Roque – Cabo San Vicente (circa 1960), an advertising freebie in association with the Spanish shipping company Ybarra Line. In 1987, designer Andrea Branzi wrote that it was the “incredible fabrics” produced in Italy after the war that had brought Italian design “out of the doldrums of rationalism”—perhaps despite the Rationalist theories on which Ponis founded his business and its aesthetic, and with which Daneri had designed the factory—and “onto the hottest beaches of post-industrial culture,” a harbinger of the soon-to-come postmodernism. Branzi’s words are brought to life at The Wolfsonian thanks to MITA, the innovative vision of Mario Alberto Ponis, and the avant-garde compositions of the artists he employed. “Made in Italy” is a rare chance to see, outside of that country, the important products of a design great. 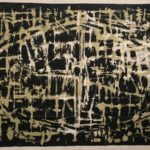 “Made in Italy” is on view through April 28, 2019 at The Wolfsonian–Florida International University in Miami Beach.